In which I tell a true story. I wondered at this sight and several questions came to my mind. How long had they been married? How many cycles of this standoff had they been through before I arrived? Had they always bickered this way or was there a time when they would have smiled and walked through the door hand-in-hand paying little heed to instructional directions? When had love cooled? To many this exchange seems trivial. Some would think nothing of this kind of fussing and maybe even think it endearing. Perhaps, but we will never know more about these two so I think it’s best to use their momentary conflict as an occasion to think on love. I’m not thinking of marital love particularly, but rather the love we are to have for one another. Do we really need to be told we should love one another? We could probably find something about it in every genre of Scripture. It’s in the law (Leviticus 19:18). It’s in the Gospels (Matthew 22:39). It’s in the epistles (James 2:8). It’s impossible to read the Bible without encountering it. Most of us are innately sensible of a need to show and receive love. Unless we have hardened conscience over time through self-centered living, we feel the pangs when we fail to love someone as we should. Aside from the natural instincts though we actually learn who and how we are to love in God’s Word. Paul wrote to the Roman Christians about loving one in another in Romans 12:9-16. He wrote that love should be genuine, without hypocrisy. He used a word for love in verse 9 that means a benevolent affection, a love that is outward focused and giving. In verse 10 he used a word that refers to the cherishing of kindred, a strong familial love, for the love we are to have for one another. He expressed a number of characteristics of the love we are to have. He used a word in verse 11 that is translated “fervent.” It means to boil and so conveys the thought of heat and energy. He contrasted it with being slothful and gives us the image of a love that is hot and energetic. Water is made to boil by applying heat and, if removed from the heat source, it will eventually cool to room temperature. Our love will also cool if it is not stirred and kept hot. How do we know if our love is cooling off? 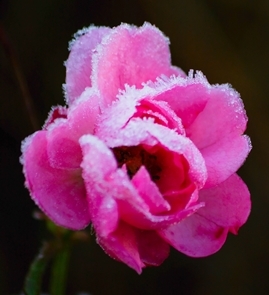 I have devised a test from 1 Corinthians 13:4-7 to help diagnose love growing cold. This chapter gives us one of the greatest descriptions of brotherly love in the Bible. So I shall proctor this exam to see how we do. Charity suffereth long—If you are impatient with others, your love has cooled. and is kind—If you are no longer seeking to be useful to or to bless others, your love has cooled. charity envieth not—If you begrudge the honor or esteem shown to others, your love has cooled. charity vaunteth not itself—If you are seeking attention for yourself over or to the exclusion of others, your love has cooled. is not puffed up—If you are haughty or feeling yourself superior to others, your love has cooled. Doth not behave itself unseemly—If you are impolite, uncourteous, or disrespectful to others, your love has cooled. seeketh not her own—If you want yours first ahead of others, your love has cooled. is not easily provoked—If you are easily angered with others, your love has cooled. thinketh no evil—If you keep a tally of offenses against you by others, your love has cooled. Rejoiceth not in iniquity—If you are delighting in anything unrighteous or being attracted to it, your love has cooled. but rejoiceth in truth—If you have little joy in the truth, your love has cooled. Beareth all things—If you are not covering the faults of others but rather bringing them to light whenever possible, your love has cooled. believeth all things—If you have no confidence in others, your love has cooled. hopeth all things—If you take a dim outlook for the prospective growth and good of others, your love has cooled. endureth all things—If you do not remain with anyone you find difficult, your love has cooled. I assure you no one gets one hundred on this test. What if you are pricked in your conscience by some of these indicators? The best word I can give you is, “Repent” (Revelation 2:4-5). When love has cooled, repent and do the hard work of loving others. It’s easy to become cynical and bitter where we blame everyone else for our own failure to love them. It’s easy to rationalize that in our minds but we are wrong when we do.